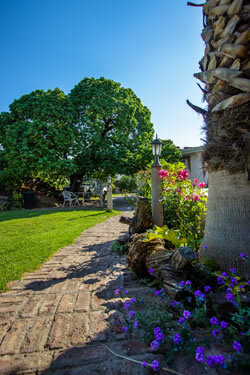 Away from the noise of the main street you will find Guinea-Fowl Guest House. Your hosts Jan and Louise Augustyn invite you to experience true and sincere Karoo hospitality. Our guests become our friends and come back time after time again to us whenever they need to overnight in Colesberg. 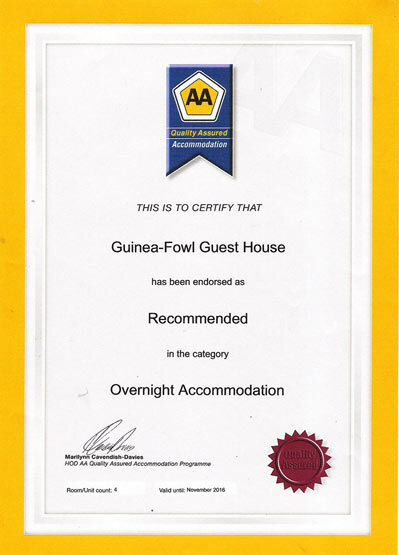 We are an AA-recommended Guest House. Starting at your own outside entrance each room has an en-suite bathroom, coffee/tee trays and a bar fridge. For the winter you will have electric blankets and heaters and for the summer roof fans. You will be served a full breakfast or continental breakfast in the lounge area on request. Some guests sit down relax and watch TV in the TV lounge area. Most spend time in the tranquil garden with its many corners to relax in and there is space for the kids to enjoy themselves and run around. We are walking distance from a few restaurants in town. Take time to relax at Guinea-Fowl Guest House with its safe off the street parking outside your room and on the premises. Next time remember to call Jan or Louise for your overnight accommodation needs in Colesberg.